Before or after tournaments and events, give your youth and teen groups some fun time together with these exciting things to do in Rogers. Rogers Aquatics Center - Kids will love cooling off at this summer spot, where they can grab an inner tube and float down the lazy river, frolic in the splash park, zoom down the water slides and splash in the waterfalls. Group discounts are available, with rates based on group size. Golf Mountain Mini-Golf - For some outdoor fun and friendly competition, head over to this mini-golfing center featuring two 18-hole courses with water features, botanical landscaping and fun themes. A pavilion is available for group rentals. Glowgolf - This indoor mini-golfing facility at Pinnacle Hills Promenade features 36 holes of glow-in-the-dark golfing, with colorful murals and décor throughout. Groups can also take the Laser Maze Challenge™ by Funovation, where participants will have to race against the clock through a challenging obstacle course of laser beams. 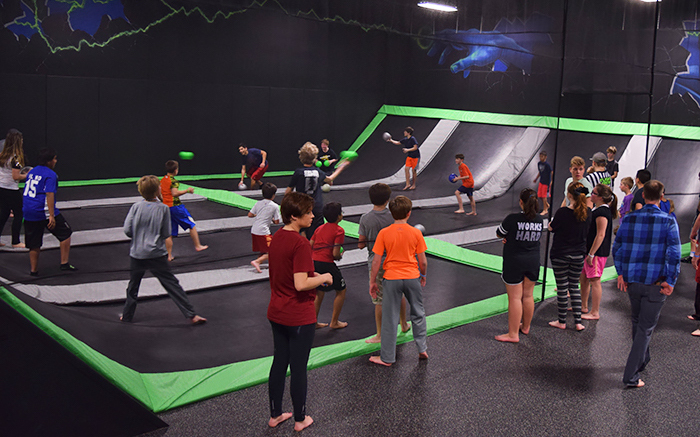 High-Rise Extreme Sports - Kids and teens alike will love the action-packed fun at this trampoline park, where they can jump, climb, swing and dive into foam pits. From a balance-testing slack line to extreme dodge ball to a ninja obstacle course, there’s no shortage of thrills. Private events and full buyout are available. Fast Lane Entertainment - From bowling to bumper cars and roller coasters to arcades, this massive play center gives your groups plenty of options for entertainment. The onsite restaurant also makes mealtime planning easy, offering pizzas, burgers, bratwursts, salads and more. Learn about private events and package pricing. Escaping Rogers - Get kids to work together and overcome fun challenges at this escape room facility, where teams will have to follow clues and solve puzzles in role-playing situations like a barber shop, boss' office and an apartment. Virtual Game World & Event Center - Transport your groups to another world at this virtual reality simulation arcade, featuring some of the most advanced simulation systems across the globe. From golf and archery to shooting and F1 racing, there are plenty of adventures to explore.